You may notice that the pictures may be different from what linked you to this tutorial. Since this is such a popular post I thought it was time to update. Don’t worry, it’s still the exact same recipe, the pictures are just prettier. Do you have dry skin too? I have very dry, flaky, kinda gross skin. My feet are gross and my legs are always dry and itchy. Yeah, I know, TMI, but it is true, and maybe some of you are the same way (especially if we are related!). About a year ago a friend made me some lotion from a recipe she had gotten from a coworker. She loved the lotion so much that she had to share it with me because that is what friends do – share! Now I love it so much that I want to share it with you! This lotion is AMAZING! It is a thicker lotion and a touch oily (but not too much, just perfect) so if you don’t have super dry skin this probably isn’t the right lotion for you. If you use this regularly the dry, flaky, itchy is going to go away. Even the lizard heels will be soft. Since I am starting to sound like a commercial, I am going to STOP and actually share with you how to make this AMAZING lotion! For the baby lotion, my personal preference is the Honey Apple but any scent will work. I also gave a range on the amount of Petroleum Jelly to use. The larger the container the more “greasy” the lotion will be. So you can customize so the lotion is perfect for you. 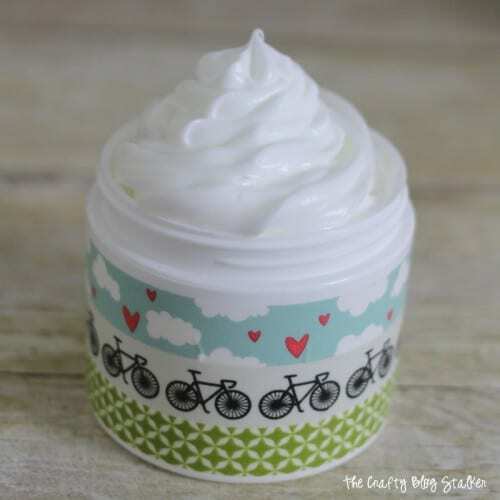 If you aren’t a fan of petroleum jelly, I do have another version of this recipe that uses coconut oil instead – Coconut Oil Lotion Recipe with Baby Lotion. mix. I bet you didn’t see that one coming! I mixed for a couple minutes so the lotion was nicely combined and whipped. 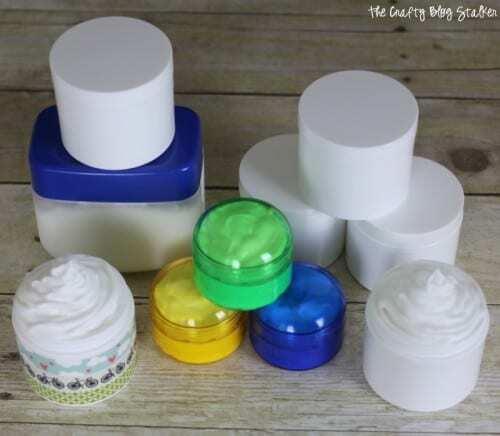 Don’t throw the Vitamin E or Petroleum Jelly containers away because you will need something to put the new lotion into, and these containers work perfectly! The labels even come off of the Vitamin E jars so easily. I love it when they do that! If giving this lotion as a gift, you can also purchase small travel jars that are the perfect size. The colored ones in the picture below hold 2.5 ounces and the colors are so fun! 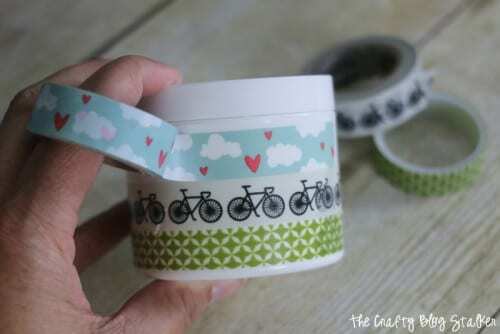 You could also even decorate the jars with a little bit of washi tape – so cute! Using a mini spatula fill your jars with amazing lotion! I found the mini spatula to be the perfect size to scoop lotion but not make a mess and get it all over the sides of the container. It almost looks like ice cream it is so fluffy! This batch of The Best Homemade Lotion filled 6 – 4 ounce jars, 3 – 2.5 ounce jars and 1 – 13 ounce jar. You can see that it makes quite a bit, and gives you lots of options to have a jar at your desk, by your bed, in the bathroom, in your purse and still enough to share with friends or family. Make sure to share this recipe with everyone you know, it really is that good. That’s why it is called The Best! When you try the recipe I would love to hear what you think by leaving a comment below. 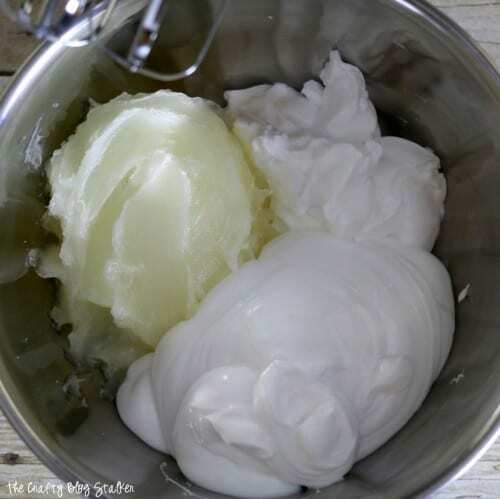 SAVE HOW TO MAKE THE BEST HOMEMADE LOTION RECIPE WITH BABY LOTION TO YOUR FAVORITE DIY PINTEREST BOARD! I was pinning today and I found this link about the best ever lotion. Well, I am very happy to see so many people using something that I mixed up and have been passing on over 10 years now. I had moved to Florida and needed help with very dry skin. It is the best and very cheap to make. If you mix the Vaseline in the middle of the baby lotion and put Vit E on top, it will not be greasy. Also, it is cheaper to purchase all items at the Dollar Store. If you put a jar in the refrigerator, it is the best thing ever for a sun burn. It also works best if applied just as you get out of the shower. Your skin will absorb it faster. I use it from head to toe and have very soft and young looking skin. Please pass a jar on, it really works! I just love it. I’m on my second batch. I gave over half of my first batch away, and everyone I gave it away to just loved it. I also printed a copy of the recipe with it. Nothing but compliments , again THANK YOU SO MUCH!! You are so welcome Iris! I am glad you like it. I don’t even know how many batches of I have made, and I still love it too! Don’t understand the Vaseline part. For all of my life, and I am 63, Vaseline was used as a protectant AGAINST moisture. Therefore, how are you getting any moisture into the mix? Hi Brenda! I am not a sciency person and I don’t understand how it all works, but I do know that it works great for my super dry skin. If you give it a try I would love to know what you think. Do U just rub into the skin? I have dry skin on cheek bones under my eyes. Could be sun damage but will try it. Yes, the lotion is meant to rub into the skin. Although I would not recommend this lotion for your face, this is more of a body lotion. Great question Renee. You put in the whole container of each ingredient. Johnson’s Baby Lotion (27 oz), Vitamin E Skin Care Cream double pack (4 oz ea) and Petroleum Jelly (7.5 – 13 oz). If you ever want to learn how to make real lotion from raw ingredients instead of mixing finished products, send me an email and I will happily teach you the basics. Never let anyone tell you not to use a preservative if water is involved. This looks fun for a DIY recipe. Thank you for sharing. I have a dry very sensible skin and it works for my whole body. I’m glad that I can order the baby lotion from Amazon because we don’t have it in the shops in Belgium. I made a few batches for my friends as a gift and they all love it . That is awesome Ria! I am so glad that it works so well for you and you were able to share with friends. I am so glad you love it, Wanda! I make a batch a year and use it all year long! Longer, and I didn’t want to smell like a baby I changed to Johnson’s Honey Apple lotion. There are a lot of people that like the way it smells and the way it feels a lot better. Can you add essential oils to this cream? Yes, you could Cassie! If you are going to add essential oils I would suggest using not scented baby lotion to make that the scents don’t compete or overpower. Thanks for sharing this. I’m “olderish” & live in AZ, so I’m excited to try this! This looks great. I have never seen the honey apple baby lotion, I will have to look for that. I have used that Vitamin E cream alone and love it. I can only imagine how good it is with the other too ingredients. Thanks for the ttorial. The oatmeal almond is a good switch for the baby lotion. Good subsitute for vasoline is coconut oil… I make this and add a little almond oil or jojoba oil.. You can get the vit e cream at the Dollar store it does not have the smell of the one that is fruit … something can’t remember the end of it.. have fun. I read this last night, I suffer from dry skin so, I HAD, HAD, HAD, to stop after work & buy everything to make this! Whipped it up, showered & tried it out. FANTASTIC! Love the way my skin feels. I am so glad you like it! It really is amazing stuff! Oh I need this lotion, thanks! I have been making this lotion for years now also. I give it as gifts and am always asked if they can have a refill on what I gave. I’m happy to share the recipe for this. I also print out little labels and decorate the jars after removing the original label. A friend gave me this recipe and said an RN started this many, many years ago because she worked with the elderly and saw how dry their skin got. The results were amazing. I use it every day myself and it’s fun to make. I am so giving this a try next time I go to the store. My daughter has EXTREMELY dry skin and is very sensitive to lotions. I can’t wait to see if this works for her. Thanks for sharing! I have to try this!! What a great tip. Glad to have you at Things I’ve Done Thursday! I am going to try this! Thanks for sharing. I found you on Toys in the dryer: Fun stuff Fridays! Thanks for sharing this. Homemade lotion is on my list of things to try this year, and I want an easy recipe. lotion these days, like crazy! The woman who use to go to my grandfathers home and help him with physical therapy always made this stuff for him. I haven’t made any for a long time. I had actually forgot about this stuff. It always made my legs and arms soooo soft! I just pinned this and I can’t wait to try it! I’m like a raisin in the winter, all dried up. Thanks for posting it! I’m addicted to this lotion after my best friend made it for me for Christmas. My skin has never been better. I’ve gone so far overboard, I’m now even putting it on my face (and it’s wonderful for that too!). Thanks for sharing! Ooh, looks very nice, I’ll give it a try! Thanks for sharing! I’ve made this and actually gave it as gifts this Christmas…it is really awesome!!!! What did you do for containers? I put the lotion back into the Vitamin E and Vaseline containers. If there is more than that I and need more, I will put it into small palstic storage containers. Thanks for linking up. This stuff looks great – I have a surfeit of lotion on hand right now, but I will have to pin this for later, when I run out. Love it! I love the sound of this recipe! I will definitely be giving it a try. Thank you so much for sharing the recipe. Has anyone with excema(sp?) tried this? My daughter has eczema and is very sensitive to dies and perfumes and she has no allergic reactions to this at all. My daughter also has excema and we have been using this for around three months. Her skin issues are nearly non-existant now! It is fabulous! I have eczema and this lotion has worked wonders on my skin! This looks great! I don’t constantly have dry skin, but sometimes I do. This would be awesome for those times. Add some aloe to this mix for a great healing balm for chapped skin! Awesome! How many oz. of vaseline do you use? Our store only sold very, very large and teeny small. I’ll have to try this because I have super dry skin. Does anyone know if this leaves you with an icky, sticky feeling or does it soak in and just leave you soft? I would love to try this, but before I go fill up all my empty containers, I wanted to ask first. Right after I put it on it feels a little greasy but my skin is so dry that it quickly absorbs within a minute or two then my skin just feels soft. It left me with an icky sticky feeling for around 2 hrs but my skin in so nice and soft this morning. I make this but I use $$$ Tree Creamy Vaseoline and a better lotion. It is a little greasy but soaks in shortly after applying. For anyone with psoriasis, make sure you use an unscented lotion in this. Where can I find the vitamin E cream??? Target and Walgreens didn’t have it. Can I substitute vitamin E oil? I purchased it at my local Walmart. I use the Dollar General Store brands of all the components of this amazing lotion. Been using it for years! I have used the vit E oil and it worked. I put the lotion mixture in a zip-lock bag and cut off the bottom corner to fill the lotion pump bottle and any container with a small neck. Love this lotion and use year around. I can’t wait to try this, sound like it works great. This lotion is fabulous! It is all we use at our house…on our bodies, faces, and even for our daughter with excema. We do refill the baby lotion pump bottle. The lotion is a nice consistancy and pumps out great. The pump prevents the little ones from scooping excess lotion out of the lotion tubs. Thank you for searching me out. I really appreciate it! Did you mix it it really good with a hand mixer? or are you at a higher elevation? Mine has never separated before so I am not sure what to tell you. I have left the lid off a couple times and it has thickened but that is all I have noticed. I am sorry I couldn’t help you more. I have really dry skin so I will have to try this. My daughter has eczema so maybe it will help her too. Thanks for linking up to Fabulous Friday! I’m going to try this lotion,I have really dry skin…my grandson has eczema would this work for it also? I made this yesterday and LOVE It!! I filled 2 large canning jars. Do I need to keep it in the refrigerator? I don’t keep mine in the fridge (ooooh that would be cold to put on! ), and it holds up just fine. I love this lotion, but I add a 1/2 cup of extra virgin coconut oil to the mix. It’s great! Oh that sounds nice! I may have to try that. I’m going to try this and send a jar to my Mother who has eczema. Thank you for this delicous sounding recipe. I’ll let you know how it works for her…oh and me ofcourse! I am sorry it left you with that icky feeling. I don’t enjoy that feeling either. Since the lotion is so thick you could try not using so much. A little goes a long way. But everyone is different. I used 4 oz of raw coconut oil in mine instead of the vaseline because I didn’t want to be greasy and its WONDERFUL and the smell is divine! I have been using this for 2 years now. I love this cream! will have vitimin E added to it! WOW – this warm winter has left me drier than ever. Can’t wait to give it a try. Enjoying my first visit to your blog from your link on Pinkopotumus.Come say hello sometime. I wrote a review of your awesome idea on my blog if you’d like to see. I absolutely love it thank you so much. I will have to try this…sounds amazing!! Just found Vanilla & Oatmeal Baby Lotion and made this recipe – LOVE IT!! It smells soooo good and my hands are so soft! Can’t wait to try this on my feet. Thanks for posting! I may have to try that next time I make a batch! Thanks for the heads up! That sounds amazing. I love anything vanilla. I have been making this lotion for a year. The Dollar Tree has vaseline in a cream formula. It is terrific. It isn’t greasy at all and soaks right in. You can add vit e oil also to thin it out a bit. I prefer the Johnsons baby lotion, love the smell. The Vaseline cream also has vit e in it. Play around with it a bit. It is terrific and all my friends love it. We get together and everyone donates a jar of something and we make a huge batch. There are so many cute jars to refill. It is wonderful. I just made my 3rd batch of this lotion, I absolutely love it. I have a skin condition called Ichthyosis and I have had to use straight vasaline or eucerin(the thick cream in a jar kind) all over my body, and this does better! I still have to do eucerin on my feet and bendy places lol! Thanks so much for posting this, it makes getting ready in the morning not so lengthy of a process! I am so glad this lotion works for you! I absolutely love it too! Do you use equal amounts of each product? I use the whole bottle of each of the products. It will help moisturize the KP but you need something more scrubby to actually minimize/get rid of it. There’s a product from Derma Doctor that is supposed to be great and I’ve also seen some DIY stuff on pinterest. Ok so I went to my local wal-mart and they didn’t have the vitamin E hand cream stuff. Does anyone know where else I can get it? Or if I can substitute it with something. I just purchased some today from Dollar General. I have been able to get it there for several months. It is usually hiding. Go to the walmart.com website and do a product search and then it will tell you if your local store carries it or if one nearby does. just bought everything I need to make this. CAN’T WAIT TO TRY IT!!! Found the Honey Apple baby lotion at Shopko (Midwest store, but has recently expanded to several hundred more locations) Found the vitamin E in the twin pack at walmart by the lotions waaaayyy on the bottom shelf. You can dump coconut oil in a bowl and whip it up like that. Works great!! Where did you find the the coconut oil ? And how much did you use? Did you mix all of the other ingredients in it as well? I have found Coconut Oil at Health Food stores like Trader Joe’s. It comes in a Mayo looking type jar and is in the the cooking oils aisle. I hope that helps! I buy a huge tub at Costco. I use it for everything…cooking and health and beauty stuff. I bet this is the same lotion/creme my mother gave me to use on my daughter who had eczema when she was a baby. It worked like a charm and I always wondered what was in it. I’m definitely going to give this a try! Thank you so much! The woman who does my pedicures recommended this to me about a year ago for my callouses. I wish it didn’t have petroleum–ugh who wants the same stuff that goes in machines absorbed into the body? Toxic. Substitute Coconut Oil instead of the petroleum jelly. You can make non-petroleum Vaseline very easily. Mix any oil like coconut, fractionated coconut oil, olive oil orsweet oil with beeswax or soy was etc. Use this in place of Vaseline in the recipe. I make something simular this way and,it is amazing! I have sensitive and combo skin and love it! I make a,big batch and then transfer it it to jar or pumps and add different essential oils for different need. For example peppermint for my feet and lavender for my face etc..
I’ve made something close to this recipe. I used the creamy vaseline from Dollar Tree, added a small tube of Triple Antibiotic cream, vit-E cream, and used the generic brand of Eucerine. It is a great lotion, but remember…..a little goes a long way. OMG … this stuff is beyond fan-tab-u-lus. I suffer from psoriasis and eczema. I made this last night and used it on my “problem” areas, and what a difference it made with just one use! I wasn’t able to find the Fruit of the Earth Vitamin E Skin care cream, but did find a generic brand Vitamin E body cream and added a bit of Coconut oil to the mix. Thanks so much for sharing this miracle cream. I’m giving some to my sister who has severe eczema and to my mother who has psoriasis. Hmmm i made this and mine is more like running lotion than thick cream like the pic. I used the 15 oz bottle of baby lotion, was that too much? I’ve been using and making this for years. I use as close to the same annoying of each product and it comes out thick. I love it! And it lasts all day! Anybody ever used Body Shop Body Butter? I’d like to make this instead but want to know how it compares! I prefer this. Any of the butters I’ve tried (bath and body, body shop, etc.) have always felt more greasy to me and the scents are usually too strong. This is lighter but more hydrating and longer lasting, imo. This is a great recipe! I have made a double recipe of this every winter for the last 10 years. I use 2 bottles of baby lotion, 2 jars of E cream, and 2 containers of vaseline. I whip the vaseline first, because it’s the hardest to get broken up. 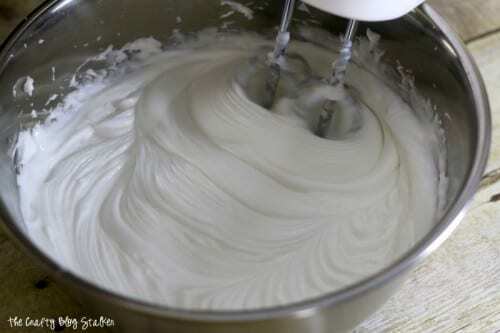 Then, I add the other ingredients and whip it with my stand mixer. I bought a pretty jar at World Market, and keep it in that. Thank you for the mixing tip! Can’t wait to make some of this! You are welcome Savannah! You are going to love it! Thank you thank you thank you for this recipe! I moved to Colorado a few years ago and my skin hasn’t been the same since. I literally can’t go to sleep without putting lotion on my hands and feet because they feel so dry and tight. I made this lotion after seeing it on Pinterest and I’m literally never buying lotion again except Johnson’s to make this lotion!! 🙂 The honey apple scent is perfect, not overpowering but nice and fresh. I used all the same ingredients and brought a jar of it to work–all of my coworkers fell in love! A few went out and bought the ingredients to make it themselves at home. I have psoriasis and this really helps my problem areas. My coworker’s son and husband have eczema and this has helped them soo much! One of the girls made a version with cocoa butter Johnson’s lotion and cocoa butter vaseline, and it’s also awesome! None of us have ever had a problem with it being greasy unless we accidentally put too much on our hands, which we then just rub all over our arms and legs! 🙂 I literally cover my body with this lotion every night and when I wake up the next morning I don’t even need to reapply the lotion because my skin is still hydrated! And let me tell you–put this lotion on with some moisturizing hand gloves and foot socks–life changing!! The vaseline also gives your skin a nice sheen when wearing shorts or skirts–again, never had an issue with a greasy feeling. On my next batch I may try to add some coconut oil as I’ve seen in the comments. Thank you again soo much for sharing this recipe! I make a lotion similar to this but use just 8 oz of vitamin E cream and 8 oz of solid coconut oil with a 16 oz bottle of baby lotion. I made this and it is truely the best lotion I have every used. I made this yesterday and it is wonderful! Even my husband liked it on his itchy, dry skin. I used coconut oil instead of vaseline and it is really nice. Next time I will warm up the coconut oil though, so it will mix a little easier. I also used Johnson’s Shea and Cocoa Butter baby lotion and it smells really nice. This stuff is great, non oily and really makes my skin feel so soft. Thank you so much! I made this last week & my very dry skin is so soft now. I do have a question do you use both jars of the vitamin E lotion?I only used one and the lotion is wonderful. I have been telling all my friends about this amazing lotion. Thanks for sharing. I do use both jars of the Vitamin E lotion. But if you like it with only one you cans ave it for next time! Thanks for letting me know how you liked it! I made this lotion yesterday with great results! I found the vitamin E at both Walmart and Dollar Tree but it was less expensive at Walmart. I used vanilla oatmeal Johnson’s lotion and cocoa butter petroleum jelly. Mine isn’t sticky at all. My boyfriend even loves it. Have you mixed this in with any lotions other than Baby Lotion or Eucerin? I wonder if it would have the same effect with some of the nice smelling bath and body works lotions? This is amazing stuff!! Thanks so much for sharing!! And it is amazing with the vanilla oatmeal baby shampoo… I love me some vanilla!! Katie, you look so much like my niece it’s uncanny! I can’t wait to try this lotion. Minnesota winters are torturous!! Thank you! I have made this for years. I find if the feet are cracked I add some A and D ointment as a extra healer. Works great! I make this and use 8oz. vasaline (or coconut oil), 8 oz. vitamin E cream and 16 oz. baby lotion. I get the baby lotion and vasaline at the Dollar Store and the Vitamin E cream and Coconut oil (solid) at Walmart. Coconut oil is in the cooking oil section and the E cream is with the lotions on bottom shelf. I use it. It works great. I’ve been making this for years and I call it “Fluffy Pink Stuff”. It is awesome! Put it on your feet overnight and you’ll have baby soft feet in the morning! Hi, can i use sunscreen with this cream? I’m concerned about the vaseline in the cream, that’s why I am asking. I am sorry but I don’t know. I had never thought of that before. I made this last night and tired it! It is amazing! I just love it! Thanks for sharing! Does it help with ecezema? Can I use it if I have eczema? My son is really allergic to Johnson soap and lotion is there anything I could substitute for it? we must be sisters! My feet are a constant battle and too many pedicures that don’t last can get expensive. Thanks so much for sharing, I’m heading out for ingredients today! Going to try this for my son who has eczema. Right now I use aveeno, which I love but is too expensive to be buying a bottle every other week. Thank you!!! I made this today and I must say that I really love this. Thanks so much for sharing. I’m wondering if homemade vaseline can be substituted for the store bought item, and if a homemade shea/coconut body butter can be substituted for the baby lotion. I’m a bit concerned about putting petroleum products on my skin. Has anyone tried making these substitutions and what were the results? There have been several comments about that on this post but I have never tried it. But if you do I would love to hear how you did it and what you thought of it! This sound like a great lotion. Must try! FYI My doctor told me to take 1 tbs of flax seed oil (large bottle at Trader Joe for $8)daily to help with any dry skin and or scalp. He said it will be good for the skin and hair as well. Thank you for the great tip Irene! could I substitute the jelly and baby lotion with creamy baby oil ? maybe ? I think it is worth a try. If you do, let me know how it goes! I have made this before and it is great! I make it for my mom and sisters too – we all love it! I wonder if I added a little rose oil if it would be too oily? I would rather smell like a rose then a baby! I think it would work just fine. IF you try it out, let me know! Is the lotion sticky to the touch? My husband hates when I put portion on because my skin becomes sticky (due to having very dry skin and having to use thicker lotions). I don’t think it is sticky. I think it is very smooth. I love this idea and am deffinately going to try it so thank you. One suggestion if you use acetone nail polish remove you can clean off printed information from reused jars/ tubs giving you a clen surfface to write lotion name and ingredients to give a fancy look to such a wonderful idea. Thanks again! Hi, I’ve made this recipe before and loved it. The Vaseline did give me a bit of a pause, but I don’t think it can actually be absorbed deeply into the skin and give you cancer because the molecules are too big to get into the blood stream. I think it just sits on top of the skin holding in the skin’s own moisture. But I do like the coconut oil idea. I’ve never used it, haven’t cooked with it or anything, I’m thinking it is going to smell like coconuts, right? Does the coconut smell overwhelm the honey and apple baby lotion? I wanted to try that this time as I didn’t really like smelling like a baby, but not sure I want to smell like a Pina Colada either! Thanks for reminding me of this wonderful recipe! You recipe caused me to finally sign up at Pinterest. I have a feeling you can spend HOURS on here, am I right? Made this lotion last weekend and it was so very quick and easy to make. I am by no means a lotion person but I am hooked. I have fair skin and am sensitive to many products (including Dove Sensitive) this has truly has helped with the extra dry skin I have had this winter (I live in the northeast). Skin feels silky smooth and so very soft. 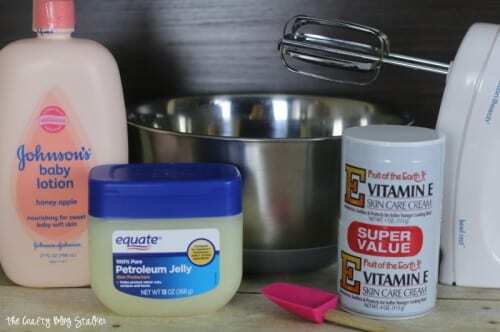 I will be making another batch today and replacing the Vaseline with Aquaphor. My husband has psoriasis and the dermotologist recommends that for patients with psoriasis. After the lotion is mixed I put it into a large zipper-top storage bag and cut a small piece from the corner for piping it into containers (like cake decorating). I found 3 oz soft feel containers at K-Mart for $1.19 each. They were in the travel-size section of the H&B area of the store. This will make a wonderful little-something gift for the holidays. Will be sure to keep a container in our RV Camper refrigerator for sunburns. Thanks for posting and sharing this wonderful recipe! I initially made this for myself because of dry skin, but my daughter has begun to use it for my grandson, who has eczema. It has drastically improved his skin. Kudos to this recipe, it has helped us both. Thanks. Sounds wonderful…just ordered all the ingredients online from WalMart! Can’t wait to try it. I am also planning to try the alternate recommendation using coconut oil in a batch and comparing the two. A great gift idea! Can’t wait! Thanks for sharing. Kathy F.
Thanks Kathy! I am sure you are going to love it! Let me know what version you like better. Thank you Bruna, I am so glad that you like the recipe! what if i dnt have that Vit E cream as its not available in my country? what can be used instead of that please share i need to make this. I add a little vitamin E oil (you can get it at Walmart) to what is left after filling my Vaseline and vitamin E jars, and put it back in the baby lotion bottle. It pumps just fine. The mix will feel a little too thick, but I just used a funnel and pushed it down with a spatula to help it through. It’s so much easier using a pump bottle than digging in the jars with your fingers. But I use both — there are times you want hand cream and times you want hand lotion. I am truely intrigued by this. I have a couple of questions I hope you can answer. 1. What is it about the baby lotion that makes this combo work so well? Do you think it might work with other lotions? 2. Have you tried different types of baby lotion with this? I just wonder if the Vitamin E one or the Oatmeal one would work ok too. Any insight you can give will be most helpful. As someone who lives in a dry, cold winter state (Illinois), I will definitely be trying this. It can’t hurt considering I scratch myself raw some winters. Thanks for putting this out there! Thanks! That does help. I have been sharing with my **gasp** non-Pinterest friends and they can’t wait to try it. This is the best hand / body cream! It’s the only thing I can use and it works so good! I make mine with the purple (lavender scent) baby lotion. I am so glad that you love it! Thanks for the testimonial. This is now my favorite lotion. It absorbs into my skin very well, and lasts until the next day. I am so glad you love it! Thanks Lisa. I’m going to give this a try! I might try some almond oil in it b/c I found out today my most favorite The. Body Shop’s Almond Butter is GONE! I just opened my last one! Let you know how it wworks! How much oil would I need for scent? Anyone know?? Thanks!! Is this lotion “pump-able”? I go through so much lotion at home I have many spare large pump bottles. or do I need jars because it’s too frothy after whipping? Thanks!! Heather, I have never put this lotion into a pumpable container so I am not entirely sure. My first thought is no because of its thickness, but it couldn’t hurt to try either. If you try, please reply so we can all know if it works. I used 27 oz bottle of vanilla oatmeal baby lotion, 9 oz Aquaphor, (2) 4 oz containers of Fruit of the earth vitamin E cream, and 16 oz extra virgin coconut oil. Do I need to make any adjustments? It is kinda thin and I was wondering what I would need to do to fix it. Did you use liquid coconut oil? To make it thicker I would add more Vitamin E cream or Aquaphor. Thanks for giving the recipe a try! You’re going to love it! Jennifer, I have never used vitamin e oil before, I am assuming it is a liquid and you want to be careful adding too much because it will make the lotion more liquid than you would want it. I would add a 1/4 cup at a time and mix it in completely and check the consistency before adding another 1/4 cup. I was wondering if you have ever added essential oils to this? I did;t know if it would mess up the texture of the lotion or anything…If you have added oils, how much would you add to it? Thank you! Andrea, I have not added oils. I think you could do it, I would just make sure that baby lotion you use is scentless so you don’t have scents that are competing. You would have to play around with the amount. Add a couple drops at a time and combine until you get the strength of smell you are looking for but also keeping the thick consistency. Let me know how it works for you! Saw this article some time ago and did not make it. I kept trying different oils finally thought I’d try it last night. So this morning my skin feels great! It’s simple and practical. I’m glad I tried it I think it’s my new staple. I am so glad that you like it Christie! It is my staple too and use it daily. I love it! what a great recipe! I just subbed to your YT channel as well. Thanks so much for sharing this link with us at the Best of the Blogosphere link up! Thank you for subscribing Amber! I am glad that you like my lotion recipe. Petroleum jelly isn’t a good lotion ingredient, especially if you buy a cheap brand. It’s a crude oil by-product. There are so many other alternatives– natural alternatives, worth exploring. Thanks for your insight Liz. I know some people don’t want to use petroleum jelly and that is why I also provided a link for using coconut oil in it’s place. This is wonderful lotion that I use only on my face every morning with or without makeup (powder with or without base). I had very oily skin before 55 but need moisture now. I have been using it daily for over 10 years. I use an easier formula of 16 oz baby lotion, 8oz Vaseline and 8 oz vitamin E. I find that it protects against the sun. Your friends will love it too. Can you use any lotion and just add Vaseline and e cream? Great question Clare! I think that most any lotion will work. I have tried it with a couple, but my favorite is the Johnson’s Baby Lotion. Feel free to try with your favorite lotion and let me know what you think! I finally made this about a month ago and I use it every day. There’s a container on my desk at work, one in my gym bag, one on the coffee table and one on my night stand. I do use it on my face, especially my forehead which is super dry and flaky and I haven’t had any issues. My knees, elbows and heels are all finally soft! I love this stuff! Thanks for you testimonial Kristy! I am so glad that the lotion works so good for you. I’m glad to know it has worked well for your face too! I am so glad you love it, Lynn!! I just made this today. It’s winter here in Kansas City and my hands have been really dry. Whipped this up in no time. It made a big batch. I really like it. I don’t find it that greasy. When I run out, will definitely make this again. Thanks. I am so glad that you like Terri! It is amazing for those dry winter hands and feet! I have made this lotion for several years now and love it. I add an anti itch cream to a portion of the recipe for use in when camping for bug bites. Just a FYI after dividing into plastic sealable contains I store all of them in the freezer. I take out lotion as needed. I have stored this lotion in freezer for at least a year it still works just as great as the day I made it. Such great tips Denise, thank you! I love adding anti-itch cream, and storing it in the freezer is genius! You might put the lotion in an empty Cake Icing tub instead I say this because I found one with some marbles for a board game and the lid wouldn’t close ( put them in a pill bottle). I use this recipe as a gift to my co-workers each Christmas. 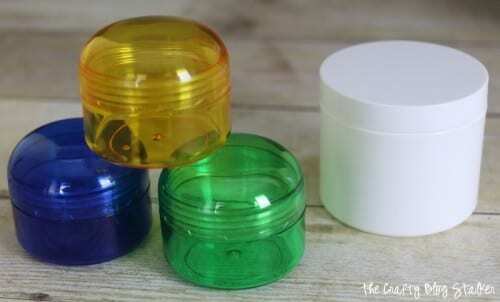 I use the small colorful containers you show in your photo. 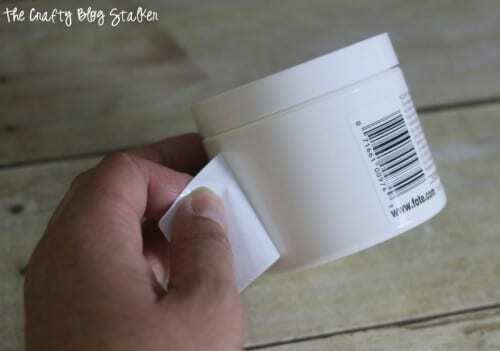 I take a large baggy and snip the corner off and use that like a frosting bag to fill my containers quickly and neatly. Thanks for an easy and very useful lotion. You are so welcome, Stephanie! I am sure your coworkers loved the thoughtful gift! My husband and I have made and used this for years. We use equal portions of Vitamin E cream, Johnson’s baby lotion and Vaseline Petroleum Jelly. Have never had a problem with using Vaseline. We have given the cream to many, many others and they always ask for the recipe. It really works on dry skin.